Admiring the amazing details of Ben Hucke's Pen and Ink style. 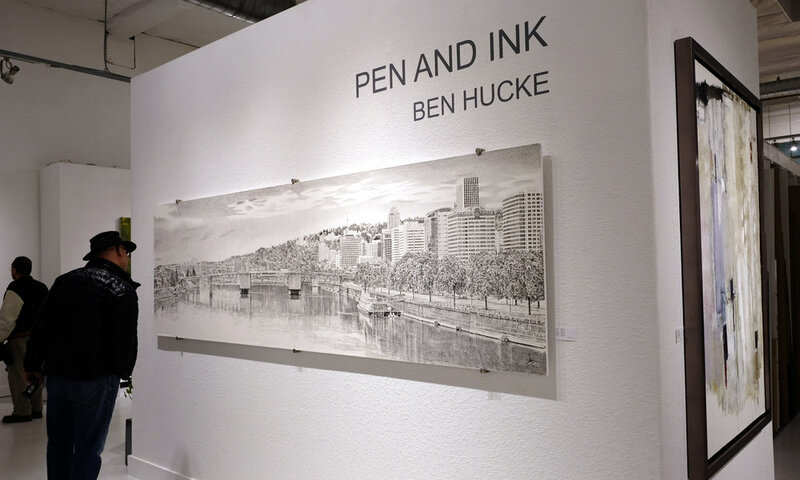 WE SAT DOWN WITH HYPERREALIST ARTIST BEN HUCKE, WHOSE SHOW, PEN + INK IS ON DISPLAY THROUGH JANUARY. 903: Your first career was as a BMX racer. What made you want to start to draw? BH: I first picked up a pen attempting to come up with some tee shirt designs. At the time a friend and I had a small clothing brand that we sold within the BMX community. After a bottle of wine and a solid attempt at creating an image the hook was set. 903: You sport a lot of other's work in the form of tattoos, did tattoos influence your love of drawing? BH: Tattoos never really played a part in me wanting to be creative in the form of drawing. Until I received a tattoo from a good friend and amazing artist himself. He did an amazing realistic portrait of my son and it wasn’t until then that I realized what art meant to me. 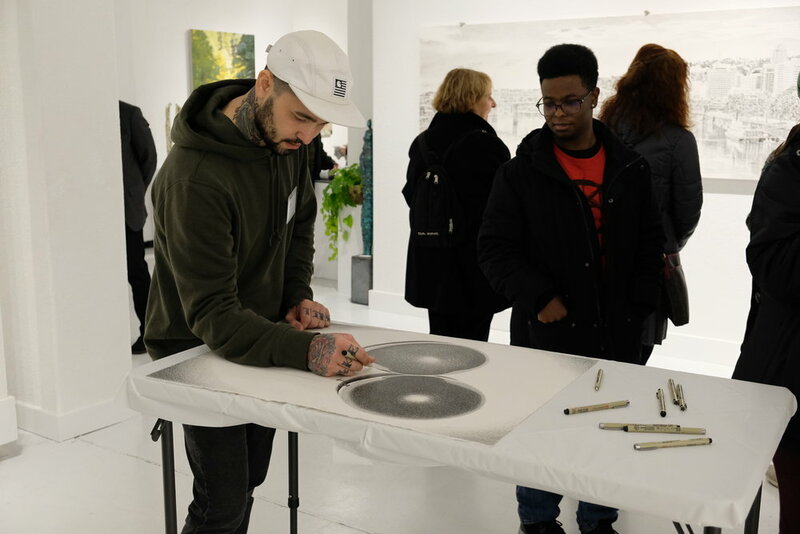 Being able to create something, the transfer of emotion from ones passion and hard work to the feeling of receiving something so special was eye opening for me. Since the drawing hook had been set already I went back home and started drawing 8-16hrs a day every single day with the intention of learning how to draw so that I could do for others what my friend had done for me. 903: You draw a variety of subjects. Some are very detailed close ups of singular objects such as your cameras and champagne bottles and others are landscapes that fill the page do you prefer one style versus another? BH: I definitely prefer centering a still life, I think that is my strong point and the challenge of bringing an object to life is my favorite. There’s something about the clean white space surrounding it that centers your eyes and makes me happy. I enjoy doing landscapes as well but typically I do them when I need a break, they are much more forgiving and allow me to get messy and a little more free for a change. 903: Your large piece, My City features a panoramic and very detailed view of Portland. How long did it take you to complete this work? BH: I spent about three and a half weeks on that piece. At the time I had pneumonia and just needed a big project to get me through it. I couldn’t lay down and it was tough to sleep so I spent all my time locked away on meds, drawing away to try and forget about how bad I felt. To be honest, looking back I hardly remember creating that piece. Maybe just being so out of it and focused on trying to breathe it just escapes me. 903: What has been your favorite subject you have drawn? BH: I would say the camera or film pieces, they’re so technical and everything has to be perfect or they won’t work. The eye recognizes when the scale or angle is off even if you’ve never seen the object before. Those pieces really play well with my OCD HA HA!